These pumps feature our positive priming system that allows the pumps to run dry continuously without causing damage. The priming system virtually eliminates leaks, reducing environmental concerns and giving the unique capability to operate under flooded-suction staging conditions. Roto-Prime priming-assisted centrifugal pumps are specifically designed for pumping petroleum products, petrochemicals and solvents. The Roto-Prime design incorporates a variable capacity vane pump which quickly and automatically evacuates air and vapor, making the pump ideal for loading and off-loading transports and stripping hoses. 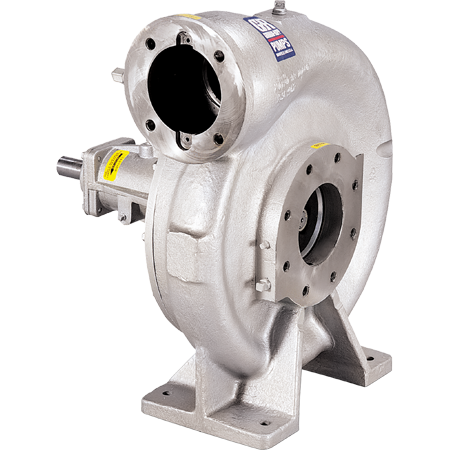 Roto-Prime pumps are actually two pumps in one: a variable capacity vane pump used during the priming cycle, and a standard centrifugal pump to move the liquid. Whenever air or vapor is present at the start of the pumping operation – or when there is a loss of suction because of air or vapor during pumping – the priming pump automatically moves air and vapor from the suction line to discharge line. Once the flowing liquid from the centrifugal portion of the pump builds up sufficient pressure in the discharge system, the pressure backs up through a tube to act on the bottom of the priming pump’s movable slide block, placing it in a neutral position during normal operation.